Check out these fun Nile River facts for kids. Learn about where the Nile River is located, its relationship to Ancient Egypt, how long it is, the agriculture it supports and more. Enjoy our range of interesting facts about the Nile River. The length of the Nile River is approximately 6650 kilometres (4132 miles). It is believed to be the longest river in the world. Located in Africa, the Nile River lies in the following countries: Kenya, Eritrea, Congo, Burundi, Uganda, Tanzania, Rwanda, Egypt, Sudan and Ethiopia. The Nile River has huge significance in regards to Ancient Egypt. Most of Ancient Egypt’s historical sites are located along the banks of the Nile River including cities such as Luxor and Cairo. In 2004, the White Nile Expedition became the first to navigate the entire length of the Nile River. The expedition began in Uganda and finished in Rosetta, taking four months and two weeks to complete. 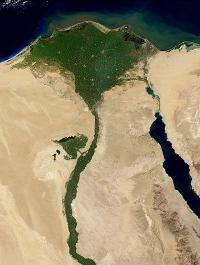 The Nile Delta in Northern Egypt is where the Nile River drains in to the Mediterranean Sea. It is around 160 kilometres (100 miles) in length and spreads out over 240 kilometres (149 miles) of coastline. It is rich in agriculture and has been farmed for thousands of years. Around 40 million people (half of Egypt’s population) live in the Nile Delta region. In 1787, the famous Rosetta stone was found in the Nile Delta in the city of Rosetta. This Ancient Egyptian artifact played a key role in modern understanding of Egyptian hieroglyphics. The Aswan High Dam was built in 1970 to help regulate flooding of the Nile River. Before the Aswan Dam was built, years that featured high levels of water could wipe out crops while years of low level water could produce famines and drought. The dam helps control these water levels.